Clothes shop on North End. It opened some time around the start of 2018. According to a photo on Flickr, as of c. 1985 the premises were occupied by a Job Centre. As of February 2013 it was a discount homewares shop called Clearance Centre photo, also offering beauty treatments and hairdressing, astrology, and mobile phone repair and unlocking. The beauty treatments and hairdressing were provided by Saan Hair & Beauty. As of October 2012, a sign outside photo advertised eyebrow threading, waxing, facials, eyelashes, massage, manicure, pedicure, hair cuts, blow dry, perms, permanent straightening, and highlights. Clearance Centre had closed by October 2013, and a clothes shop called Love London Fashion photo had opened up instead. However, this closed in late April or early May 2014 photo. For a day or two in May 2014, it was used as a sales room by a company called Olympic Sales photo. 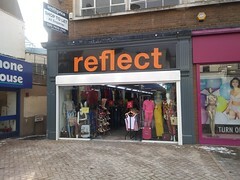 By late July 2014, clothes were again being sold from the shop, and the frontage remained the same, with the Love London Fashion signage photo, though it wasn't clear if it was under the same management as before. It had closed again by late December 2014 and was once again used as a temporary sales room photo, this time for a company called Laurelle. By early January 2015 it had reopened as a clothes shop, this time called Latest photo. This closed down again some time between May and November 2016 photo. Another clothes shop called Look Out, Lady! (LOL!) opened in November or December 2016 photo. It closed down again about a year later. Last edited 2018-08-13 15:22:26 (version 48; diff). List all versions. Page last edited 2018-08-13 15:22:26 (version 48).